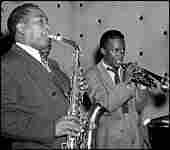 Remembering Bird: A Poem for Charlie Parker Legendary jazz musician Charlie Parker died 50 years ago Saturday. Poet Joe Pacheco recalls one of Parker's last performances, when the saxophonist known as "Bird" played in Manhattan. The poem is from Pacheco's book The First of the Nuyoricans/Sailing to Sanibel. 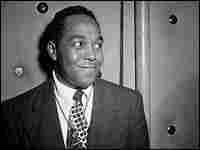 Legendary jazz musician Charlie Parker died 50 years ago Saturday. Poet Joe Pacheco recalls one of Parker's last performances, when the saxophonist known as "Bird" played in Manhattan. As he helped usher in a new age in jazz, Parker recorded many unforgettable tunes: "A Night in Tunisia," "Ornithology," "Salt Peanuts" and more. His influence in establishing bebop has lasted for decades. Joseph Pacheco is a poet and a retired New York City school superintendent. He lives on Sanibel Island in Florida. Pacheco's poem is from his book The First of the Nuyoricans/Sailing to Sanibel. don't like the locals because they dress "sloppy,"
it's not a chess move but something real cool and unusual coming down. And he is going to blow tenor, not alto. and how high he is now. he follows a two-note "mop mop"
a few weeks before he died.